A new poster has been released for the upcoming Expendables 2. 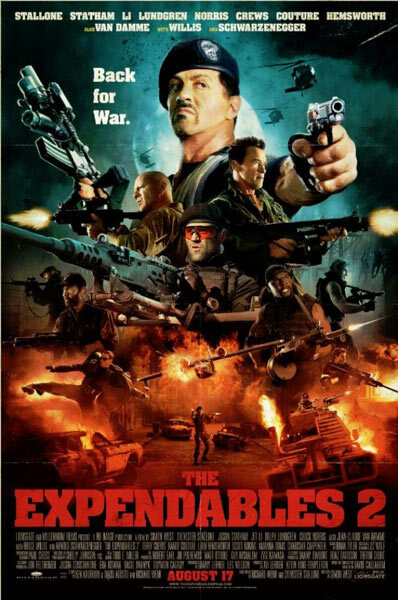 Barney Ross (Sylvester Stallone), Lee Christmas (Jason Statham), Yin Yang (Jet Li), Gunnar Jensen (Dolph Lundgren),Toll Road (Randy Couture) and Hale Caesar (Terry Crews) — with newest members Billy the Kid (Liam Hemsworth) and Maggie (Yu Nan) aboard — are reunited when Mr. Church (Bruce Willis) enlists the Expendables to take on a seemingly simple job. Hell-bent on payback, the crew cuts a swath of destruction through opposing forces, wreaking havoc and shutting down an unexpected threat in the nick of time — six pounds of weapons-grade plutonium; enough to change the balance of power in the world. Directed by Simon West, Expendables 2 is due out for release on 17th August 2012.